The Media Chest is perfect for giving your television a home and providing storage space. The top of the chest has a cut out for placing electronic devices making it easy for remote access, running electrical cords through the back and keeping everything ventilated. The chest features four drawers. The two drawers on the top are small and ideal for keeping DVDs, remotes and any small accessories. The bottom has two large drawers adding extra space to keep bulkier clothing and bed linens. 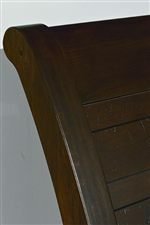 This chest has molding around the top and base with bracket feet adding character. 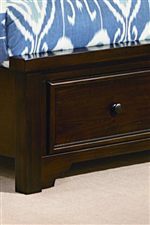 The Chest has wood planking around the sides with a distressed finish keeping it casual and giving it an aged feel. 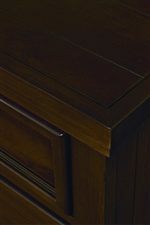 The dresser is made in the USA with veneers and selected hardwood solids. The Hanover 4 Drawer Media Chest w/ Wood Planking by Vaughan Bassett at AHFA in the area. Product availability may vary. Contact us for the most current availability on this product. Case Detail Molding framing the furniture with bracket feet. Drawer / Shelf Construction Select drawers are lined with felt for jewelry storage and others are cedar-lined giving off the natural aroma and protection of stored items. The Hanover collection is a great option if you are looking for Casual furniture in the area. Browse other items in the Hanover collection from AHFA in the area.